Updated 10:45 PM EDT: ESPN New York’s Wallace Matthews has the moving parts of the Jeffrey Loria/Randy Levine conversations that kicked off the trade talk between the Marlins and Yankees about Alex Rodriguez. 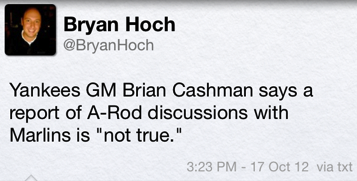 Included in there is the bombshell detail that explains the unfortunate Brian Cashman’s denial this afternoon. He might be the Senior Vice President/General Manager of the Yankees, but he doesn’t make all the deals and some of them they don’t even give him a much of a heads-up on. Updated 4:04 PM EDT: Yankees’ Senior Vice President Brian Cashman has denied to MLB.Com’s Yankees’ beat reporter Bryan Hoch that there have been any A-Rod trade talks with the Marlins. Cash – whom I like – is, say, incorrect. I’d also like to point out that the last time Brian Cashman denied something involving me, it was to tell me and a crowd of reporters that my tweet showing Rodriguez receiving post-pitch detail signals from the stands on Opening Day in 2011 was not an issue for the ballclub and the team was just fine with me and had no problem and everything was just fine. Three months later they threw me out as Bob Wolff’s assistant at the P.A. microphone for Old Timers’ Day and leaked it to The New York Post. The New York Yankees have held discussions with the Miami Marlins about a trade involving their third baseman in crisis, Alex Rodriguez. Sources close to both organizations confirm the Yankees would pay all – or virtually all – of the $114,000,000 Rodriguez is owed in a contract that runs through the rest of this season and the next five. One alternative scenario has also been discussed in which the Yankees would pay less of Rodriguez’s salary, but would obtain the troubled Marlins’ reliever Heath Bell and pay what remains of the three-year, $27,000,000 deal Bell signed last winter. None of the sources could give an indication as to how serious the discussions have already gotten, but one of them close to the Marlins’ ownership said he believed the trade made sense for both sides, and would eventually be made in some form. Not only are the Yankees one loss away from elimination in the American League Championship Series (and as of this writing, one loss away from an ignominious sweep), but in the post-season Rodriguez is just 3-for-23 with twelve strikeouts, has been pinch-hit for twice, and was left out of one of the Division Series games against Baltimore entirely. He last homered on September 14, and has only one extra base-hit and six RBI in the 24 games since that date. 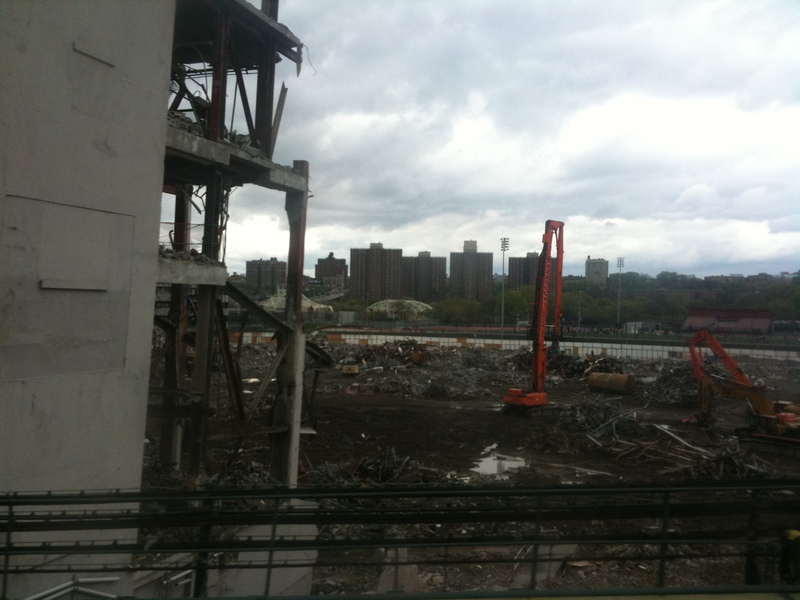 Rodriguez has become a Gordian Knot for the Yankees. As the roster grows old and the farm system is in a fallow period for position players, the Steinbrenner family wants to reduce payroll, not increase it. And while the precise salary numbers are not known, Rodriguez is scheduled to earn approximately $28 million next year, $23 million in 2014, $22 million in 2015, $21 million in 2016, and $20 million in 2017 – when he will be 42 years old. His physical fragility and declining power now make him just slightly less valuable than the average American League third baseman (by one calculation, Rodriguez’s WAR number – “wins above replacement player” – was 2.0, seventeenth best among Major League third basemen, just behind obscure rookie Luis Cruz of the Dodgers). Nevertheless, paying Rodriguez $114 million not to play for them would seem to be against the new – cheaper – thinking at Yankee Stadium. But to a Marlins’ franchise facing financial calamity after the failure of its combination of splashy free agent signings, a high-profile new manager, and a brand new downtown stadium, a “free” Alex Rodriguez has serious upside. He grew up in the community, owns an incredibly high-priced home there that he has been unable to move, and might be refreshed by both the release from the New York cauldron, and a possible move from third base to first base with his new club. Such a position change would be blocked in New York by the presence of first baseman Mark Teixeira and the club’s self-perceived need to rotate the aging Yankee regulars in the Designated Hitter spot. The degree to which the cauldron was heating up was underscored by a dubious story in Tuesday’s New York Post, which claimed Rodriguez was trying to get the phone numbers of two women seated behind the Yankee dugout during Saturday’s American League Championship Series opener by utilizing the age-old athlete trick of having autographed baseballs delivered to them. But the “drugs” tweet was only the culmination of a day of off-and-on attacks on Rodriguez by Trump. For more than a year the club has been aggressively retaliatory towards those – like Trump – who have invoked Rodriguez’s admission of steroid use, and others who have been critical of him in any other way. Over the past summer the team suspended team Advisor and Hall of Famer Reggie Jackson for questioning what impact Rodriguez’s confession would have on the legitimacy of his career statistics. Later in the season, a Yankees’ media relations staffer bypassed a new formal appeal procedure and was heard shouting at an official scorer who had given an error to an opposing player rather than a base hit to Rodriguez. Yankees’ media relations director Jason Zillo was described in a 2011 book as being “close” to Rodriguez. In the same book Rodriguez called Zillo a “friend.” In 2011, Zillo and the Yankees had similarly tried to squelch stories about the seeming deterioration of the play of Derek Jeter. Trump’s call for the Yankees to “terminate” Rodriguez’s contract for “misrepresentation” is not a practical solution in a time with a strong players’ union, and given the fact that in the off-season of 2007-08 the Yankees happily kept Rodriguez from leaving for free agency by giving him a new ten-year contract that ensured that his pursuit of the career home run record would come while wearing their uniform. More over, the confession came in February, 2009, and if any claim to void the contract could ever have been made, it would have been then, and not now. The Yankees presumably are not happy with Trump’s tweets. But they are less so with Rodriguez’s vanishing adequacy. And if the Marlins provide an escape hatch – even an escape hatch costing them either $96,000,000 (if they were to swap Rodriguez for Bell) or $114,000,000 (if they just give him away, or obtain low-cost players or prospects in return for him) – the Yankees are prepared to ignore the business consequences to offload a formerly great player who with each week seems to turn into simply a more and more painful headache. Good call here by me about the Mets not calling up Ike Davis soon. I was right, it wasn’t soon. It was now. But it may not be intended as a permanent solution. Daniel Murphy is still in the team’s thinking, he can’t play the outfield, there’s nothing for him to do at third base, and they’d still like to keep Davis from Super-Two status. It is plausible that unless Davis sets the world ablaze, he could still be headed back to Buffalo if and when Murphy heals. And given recent experience with Mets’ position prospects (Carlos Gomez, Fernando Martinez), setting the world ablaze seems to be more difficult than we think. In the interim, the Mets have reliever Tobi Stoner (no relation to ex-MLB pitching prospects Brandon Puffer and Jung Bong, or as one of my fellow Twitterites added, Herb Hash of the 1940-41 Red Sox). This would be my fellow tweeter @Str8edgeracer after a busy weekend that saw him pitch effectively against the Yankees, then saunter out to my old digs in Secaucus, New Jersey to work with the MLB Network folks for about half an hour. 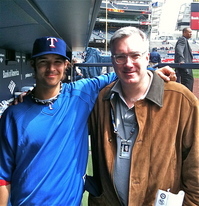 I’ve seen a lot of active players presage their later broadcasting careers (Joe Magrane was my analyst for the local pre- and post-game shows for the post-seasons of 1990 and 1991 on the CBS station in Los Angeles) but almost none of them have come close to the Rangers’ pitcher. He’s a natural: honest, self-effacing, easily understood, and, best of all, proactive about discussions – not just answering questions but asking them. 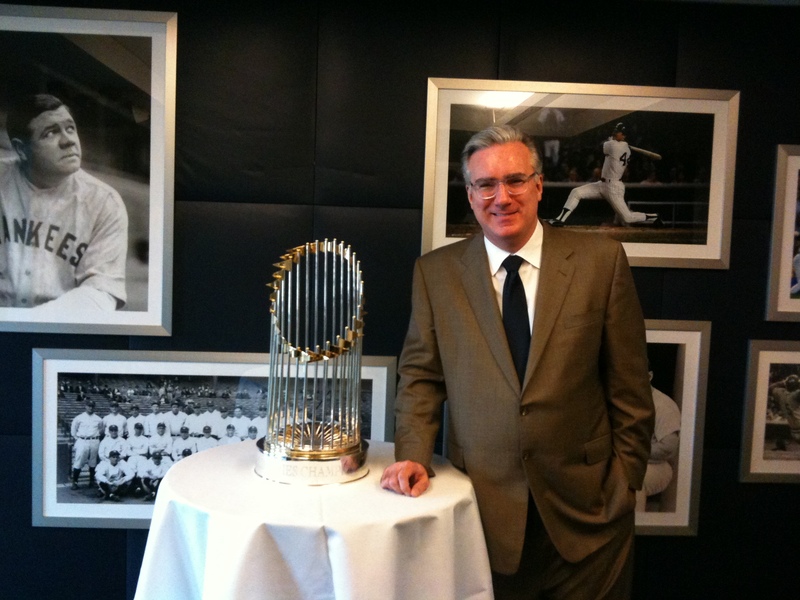 And, of course, we took this picture for the benefit of the Great World Of Tweeting (@KeithOlbermann here). 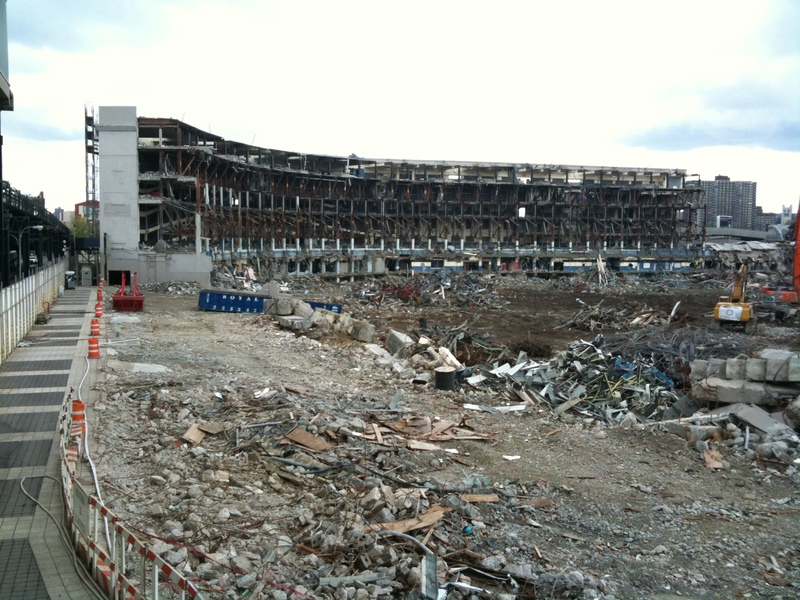 Ground level, obviously, looking from what used to be more or less dead center. 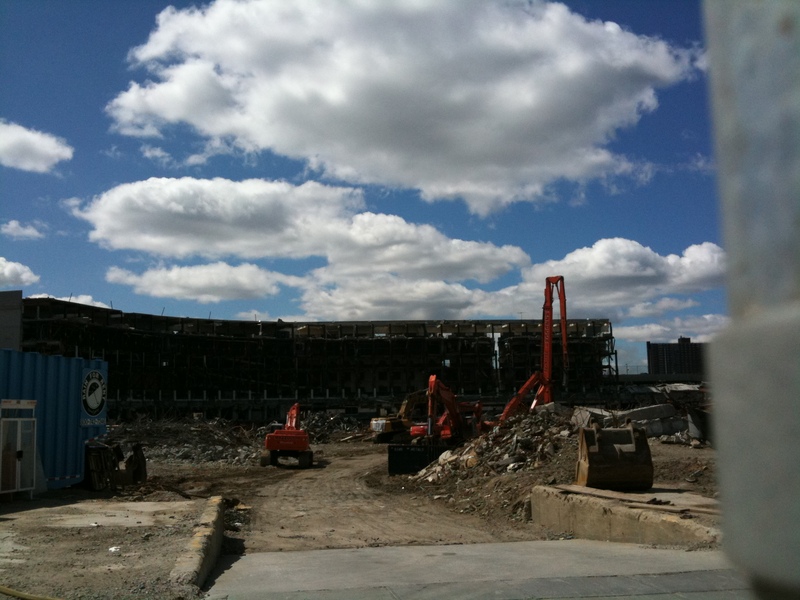 I was surprised this one worked well – taken from a moving 4 Train, showing you the exact spot where it’s no longer standing, and where it still sort of is. From 161st Street Station. Says most of it, if not all of it. Yankees holding the Trophy Polishing Moment at their midtown suite display (about a 45-second walk from my office) Friday afternoon and I couldn’t resist. But what do you find really interesting about this photo? 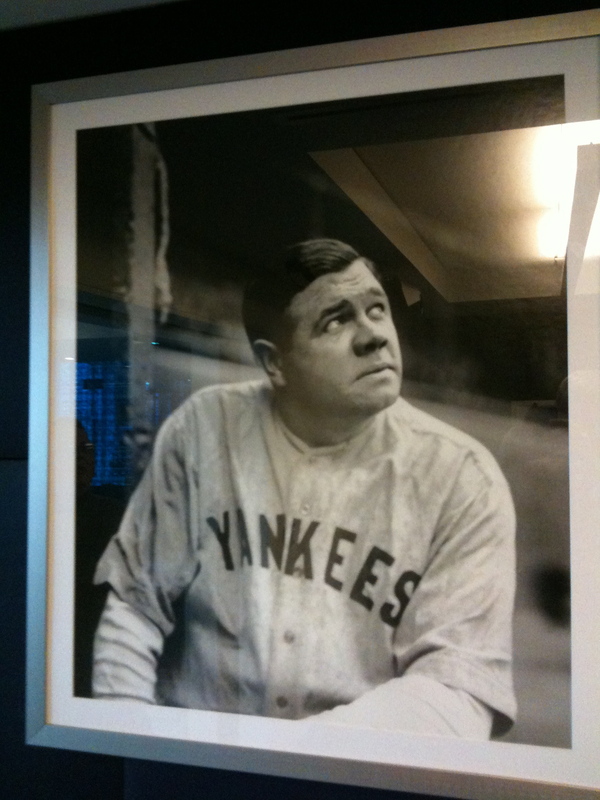 That’s right – it’s the photo of The Babe on the far left, looking as if somebody just told him the upper deck was on fire, with all his money in it. Have you ever seen that shot before? I couldn’t elude the overhead fluorescents, but I did my best. Yes, I’m tweeting. 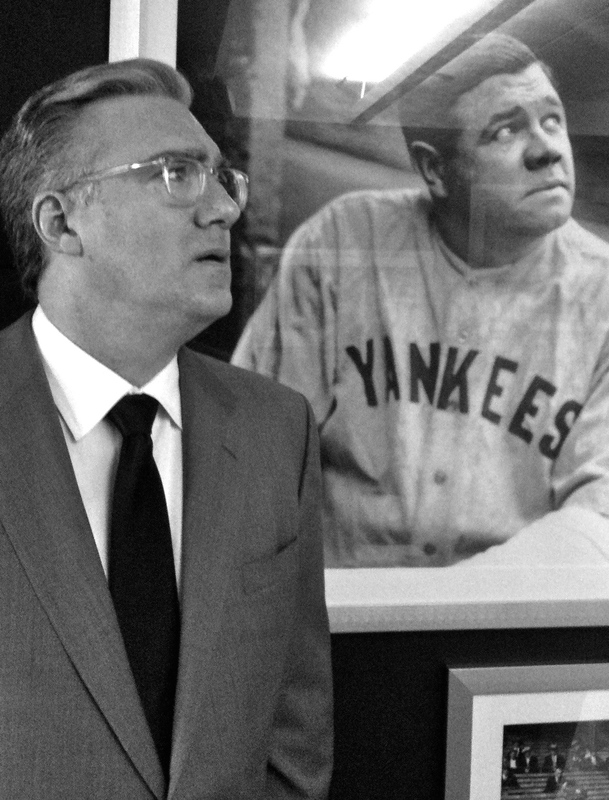 @KeithOlbermann – baseball, inside television, advisories of new blog posts here – so far no politics but that’ll probably change (let’s put it this way: it will presented gently). Gil McDougald confirmed, many years after the event, that his retirement from baseball after just ten major league seasons, owed in large part because of his loss of his sense of joy after the Herb Score incident in 1957. The vision – and career – of the lefthanded pitcher with the greatest start in baseball history would never be the same after he was struck by a line drive near the eye. McDougald was physically uninjured, but he was the man who hit the ball, and psychologically, he never really got over it. To that end, this snapshot of Miggy Tejada last night running, his interest in the safe or the out decreasing with every stride, after he knocked Jeff Niemann to the turf in St. Petersburg. 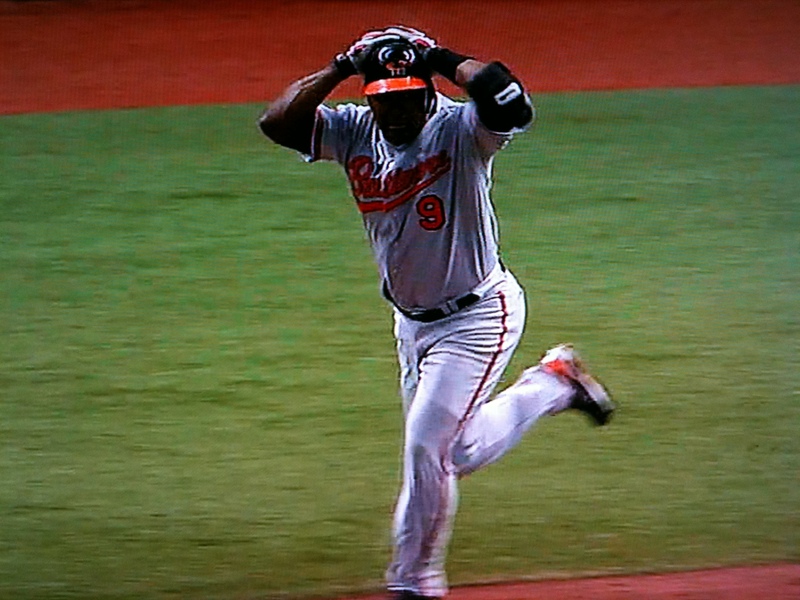 At that point, Tejada could not have known that his comebacker hit Niemann not in the head but in the shoulder, and that the Rays’ big twirler might even be back for his next start. But it underscores that while the pitcher is the obvious victim of such cataclysms, we should give a moment’s thought to the scare the batter experiences. Made the big leap into 21st Century Social Networking last night. I’m up on Twitter and will dispense baseball nuggets and advisories of new blog posts as warranted at #KeithOlbermann. Now available without a prescription. at 23-7. Whatever led him downhill, it wasn’t the marathon against Marichal.